Kevin Humphrey's 23 years of experience in the Tyler homebuilding trade, coupled with his business education gained at the Harvard Business School and his engineering skills earned at the University of Missouri, serve as a strong basis for his home design and homebuilding services. We can build your design, or help you design your very own dream home. 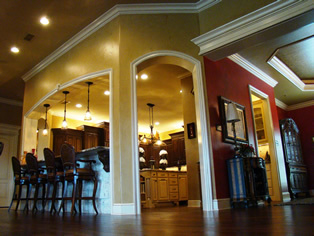 As a custom builder, we want to build whatever size home best fits the client's needs and lifestyle. We build in multiple Tyler communities, but also often build on a client's lot. Kevin works with his clients during every step of design and construction, guiding you through decisions and selections. And if needed, he can help locate a building site and custom design your house plans. Consultation - The building process begins with an initial consultation to discuss client objectives, budget, desired building locations, financing options, lifestyle (indoors and outdoors), and personal decorating preferences and styles. Site Selection - Kevin has extensive knowledge of the Tyler area, and the availability of lots or tracts. Kevin will walk with you on potential sites and review suitability for your requirements. As potential building sites are identified with the home owner, factors such as drainage, utilities, site preparation, foundation costs, etc. will be considered. Detailed discussions on matters such as whether the client desires a gated or open community, school district requirements, commuting distances, views, acreage, property tax assessments, sewer vs. septic systems, etc. will be conducted. 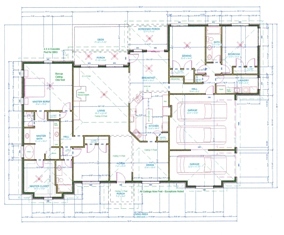 Home design and floor plan development - Using the knowledge he gained in earning his engineering degree, Kevin will review the client's conceptual ideas, sketches, notes, preliminary drawings, photographs, floor plans, magazine articles, etc. as the house plan design evolves. If you have your own blueprints, we can build from those. If you need help designing your home, that is also an option. Discussions will be held about floor plan concepts, square footage requirements, number of bedrooms, baths, interior design features, furniture locations, electrical requirements, energy efficiency, and exterior design styles. We will also discuss building materials such as window styles, roofing, brick color, stone, siding, concrete stains, decking, etc. At the conclusion of this phase, Kevin will present a final home design document along with pricing, floor plans, blueprints, and a proposed building schedule. Construction - Once a contract is finalized and financing arranged, we will proceed with securing necessary city and county permits, and begin lot clearing, grading, erosion control and pad preparation. As construction continues, meetings will be held with the client regularly at the site and at our offices to keep you involved in the process, and up-to-date on progress. Occupancy - We will assure that all final details and punch lists are worked, and that the client is satisfied. At Kevin Humphrey Homes, client satisfaction is paramount! Our client testimonials show we succeed in achieving this goal!